Great Opportunity for You and MADAC! Want to go on a dream vacation and support MADAC too? Here is your chance! Getaway2Give has graciously donated a Passport 5 night stay at one of their 18 luxurious locations (2 – 6 bedrooms) and more! MADAC is offering this incredible opportunity to the highest bidder – Retail Value is $ 7,000! Get a group together and split the cost for a true vacation! Stay tuned for monthly offerings! Enjoy a stay in your choice of destinations in highly sought after beach, mountain, city and leisure locations. The Passport Program provides you with the flexibility to choose your destination after purchasing the trip – you have 18 months to decide! In addition to flexibility, take advantage of pre-trip planning services and a local concierge – both included with the Passport Program. After witnessing the impact of the Music Therapy Program at Children’s Healthcare of Atlanta, MADAC Advisors voted overwhelmingly to support the program in a big way with a $9,000 grant. “Thank you again for your generosity to the Music Therapy Program. Our team is thrilled with MADAC’s enthusiasm for this program! Our Child Life team is excited too to add another MADAC training doll for patients!” said a grateful Jennifer Wells, Associate Development Officer for CHOA Foundation. One of MADAC’s initial gifts was to CHOA for a “Chester Chest” training mannequin. Mothers And Daughters Against Cancer has supported the American Cancer Society’s Hope Lodge with a grant of $1,000. “MADAC’s gift will ensure guests, both patients and their caregivers, get the information they need from our Hope Lodge Resource Center,” said ACS Vice President Crystal Mantooth. MADAC is honored to announce new Advisors Alex Graveline-Miller, Kristen Henderson and Kim Ragland. MADAC advisors meet annually to review funding requests and determine grants. 2018 Axiom Corporation Auction & Golf Tournament A HUGE Success thanks to you! Early results are in from the 2018 Axiom Corporation Auction and Golf Tournament benefiting Mothers And Daughters Against Cancer/MADAC! Over $30,000 was raised at the Silent and Live Auction during the reception at the Buckhead Club on the evening prior to the tournament (click to see photos)! Combined with the money raised from the golf tournament, Roger House's goal of $50,000 to MADAC has a great chance of being met! The vision and enthusiasm of Roger and Jennifer House and support of MADAC have been beyond inspirational and appreciated! These events were successful thanks to the sponsors, attendees, golfers, supporters and YOU! The money raised allows MADAC to continue our mission of mothers and daughters making a difference in the fight against cancer! Please take a look at MADAC's latest endeavors. Thank you again for your continued support and hope to see you and others next year! New for 2018 will be a pre-event cocktail and auction event for all sponsors and golfers, plus spouses or special guests. The event will be held the evening of Wednesday, May 16 at the Buckhead Club. We'll have a silent and live auction to raise money for MADAC, along with networking and socializing in a highrise venue overlooking the city. Bid on fabulous items including vacation packages, a chef-prepared in-home dinner for 10, sporting events, sports memorabilia, personal services, fine wines, jewelry and more. All proceeds will go to MADAC. Details will be provided to golfers and sponsors prior to the event. Axiom Corporation's 5th Annual Charity Golf Tournament to benefit Mothers and Daughters Against Cancer (MADAC) will be Thursday, May 17, 2018 at Heritage Golf Links in Tucker, GA. Register now at https://squareup.com/market/axiomgolf so we can raise more money than ever this year for MADAC. Thanks in advance for your support! Axiom Corp's Charity Golf Tournament a Huge Success!!! 4TH ANNUAL AXIOM CHARITY GOLF TOURNAMENT BENEFITTING MADAC! It's time for the 4th annual Axiom Corporation Charity Golf Tournament benefitting Mothers and Daughters Against Cancer (MADAC)! It's May 25, 2017 at Heritage Golf Links in Tucker, GA.
WE NEED YOU to register to golf, become a sponsor, give a general donation, or spead the word. If you don't golf, you can still help. You can sign up online or by mailing in a check with the registration flyer. We also need silent auction items and goody bag items. Thank you to our growing list of sponsors, which include Getaway2Give, Harrison Development and Construction, SmartCare Urgent Care, Meridian Insurance, Docqmax, and Patron Spirits. It's always a fun day on the course and a great way to raise a lot of money for a very worthy cause. Thanks in advance for your support! SAVE THE DATE! The 4th Annual Axiom Corporation Charity Golf Tournament will be held Thursday, May 25, 2017 at Heritage Golf Links in Tucker, GA. We'll be looking for golfers, sponsors, donors, and more. The tournament will again support Mothers and Daughters Against Cancer (MADAC), an Atlanta-based organization which provides support to people of all ages fighting a variety of types of cancer. More information and the registration site are coming soon. Through the third annual Axiom (http://www.axiom-corp.com/) golf tournament and generous donations, MADAC announced it will be funding the following for 2016, continuing to make a positive difference in the lives of others! Thank you Axiom and donors! She had already heard those devastating words once. But in 1998, just seven years later, Susan Highsmith Graveline heard them again - "You have cancer". Three weeks earlier Susan had founded Mothers and Daughters Against Cancer out of a desire to teach her then 8-year-old daughter Alex how to be active and positive in the fight against cancer. She now had to walk that road again but this time with the support of 15 other mother/daughter pairs -the charter members of MADAC. 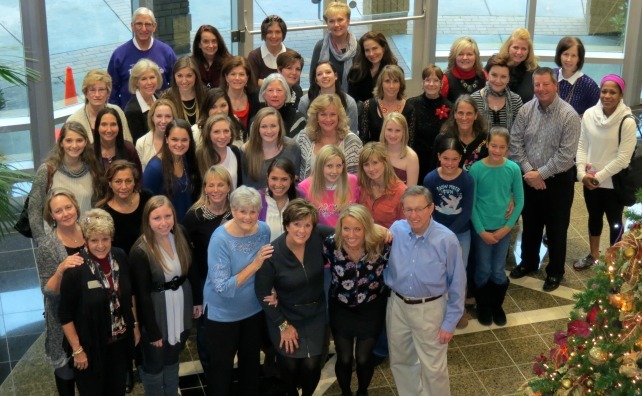 Since then, under the guidance of Susan, MADAC has raised more than $1 million for cancer-related issues and impacted numerous mother/daughter pairs. "We've supported Relay for Life since the very beginning, since that's where we got our start. In fact, MADAC created the purple glove dance that now starts all the relays," Susan said. "We've also supported the American Cancer Society, the patient resource navigator at Gwinnett Medical and other organizations such as the Thomas F. Chapman Family Cancer Wellness program at Piedmont. We've provided college scholarships for cancer survivors as well." Three years ago, MADAC became a Community Foundation fundholder in hopes of growing their giving capacity even more. "We needed to find a more effective way to let people know about MADAC and also be able to grant requests. We felt that the Community Foundation would best serve those goals so we opened a fund here," Susan said. "Our goal is to grow the fund so we can provide even more grants for cancer-related issues." "We want make a difference in the fight against cancer on a local level throughout Gwinnett County and the surrounding area." To donate to MADAC's fund, contact the Community Foundation. For those seeking a grant for cancer-related issues, go to http://files.constantcontact.com/c83c9af0401/6d4c60b6-ba8a-42fa-bd2d-8d0fb2ba0fbb.pdf to download the grant application and guidelines. The 3rd Annual Axiom Corporation Golf Tournament is just a few weeks away. Thanks to all of our sponsors, donors, and registered golfers so far. We still need more golfers and sponsors! 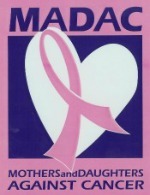 Or, if you aren't a golfer but just want to help the great cause Mothers and Daughters Against Cancer (MADAC), you can make a monetary donation toward the tournament on the registration web page. Thanks for helping Axiom raise a lot of money to support individuals and their loved ones fighting all types of cancer. Axiom Corporation's 3rd Annual Charity Golf Tournament will be held May 26, 2016 at Heritage Links in Tucker, GA. We'll be looking for golfers, sponsors, donors, and more. The tournament will again support Mothers and Daughters Against Cancer (MADAC), a fabulous Atlanta-based organization which provides support to people of all ages fighting a variety of types of cancer. Thanks to Dantanna's Restaurant and Docqmax for already committing to supporting this fundraiser with lunch and signage! Join us for the Purple Glove Dance on Center Stage on Friday, May 13! Relay For Life of Gwinnett is the largest fundraising event in the world for the American Cancer Society raising in excess of $1.83 million in 2015. Please join us and take action against a disease that has taken too much! MADAC was honored to be the fundraising recipient of The Buckhead Club's NOW (Network of Women) luncheon! Making a positive difference in the lives of others for breast cancer awareness month. Read what the Gwinnett Daily Post had to say about our very own Susan Highsmith Graveline in October! MADAC Selected 1 of PGA’s Top 50 Charities! Madison Winn, one of our 2011 MADAC Scholarship Winners! Alpha Omicron Pi: Surviving "You Have Cancer"